$300 Instant Savings. Expires Jun 27, 2019. * All prices reflect savings. Discover the wonders of Thailand! 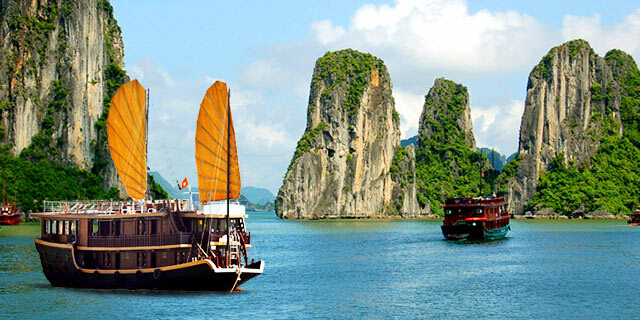 You'll encounter an ancient, fascinating culture, friendly, welcoming people, gorgeous, peaceful countryside and bustling, modern cities, and the most amazing shopping—unbelievable bargains included! 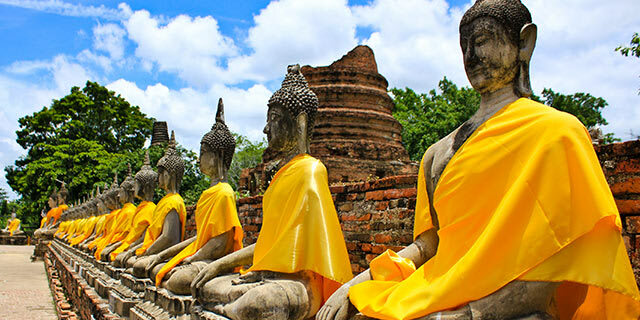 Start your journey in the bustling capital city of Bangkok, and then travel by motor coach to the famous Damnoen Saduak Floating Market, the historic River Kwai and the ancient city of Ayutthaya. 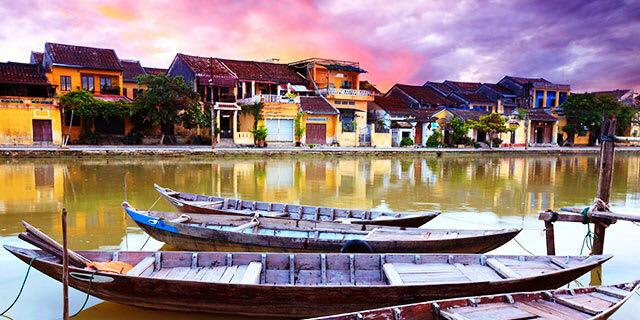 Next, you'll fly to Chiang Rai, Thailand's northernmost city, and visit the Hill Tribes of surrounding region. Continue by road to Chiang Mai, the “Rose of the North” and experience the water festival of Songkran, Thai New Year! Play a fun role in the Songkran Festival as street parties, family reunions and friendly water fights are all combined to create a lighthearted and festive atmosphere no matter where you go! Stop by ancient temples and observe the Songkran rituals of alms giving, water pouring over Buddha images and sand castle building. But don't wait too long to reserve your spot, our groups are small, our prices are exceptional, and space is definitely limited. Instant Savings: Get $300 off if you book by Jun. 27, 2019! Accommodations: 3 nights COMO Metropolitan or similar, Bangkok. Included meals: Dinner. Optional Excursion: Old Bankgok Street Food Tour (purchased locally), $40 pp for 2019; $45 pp for 2020. This morning, venture on a street food tour of Bangkok! Stop by Wat Suthat, one of the oldest and largest Buddhist temples in Bangkok. Wander down quiet streets to a small, historic coffee shop for old-style Thai coffee, then continue to a stall making ‘khanom thua paep,’ a unique rice crepe. A few steps away sample another local specialty, ‘qui chaii,’ a dumpling stuffed with delicious vegetables. Optional Excursion: Calypso Cabaret Show (purchased locally), $45 pp for 2019; $48 pp for 2020. This evening, transfer to the Thai dance show at Calypso Cabaret, one of Bangkok’s renowned shows. Calypso Cabaret is located at Asiatique the Riverfront, which is a famous night venue for dining, shopping and entertainment, and features its unique setting with a panoramic view of the Chao Phraya River. Afterwards, transfer back to your hotel. The afternoon is at leisure to explore Bangkok on your own, or join other locally available optional excursions. 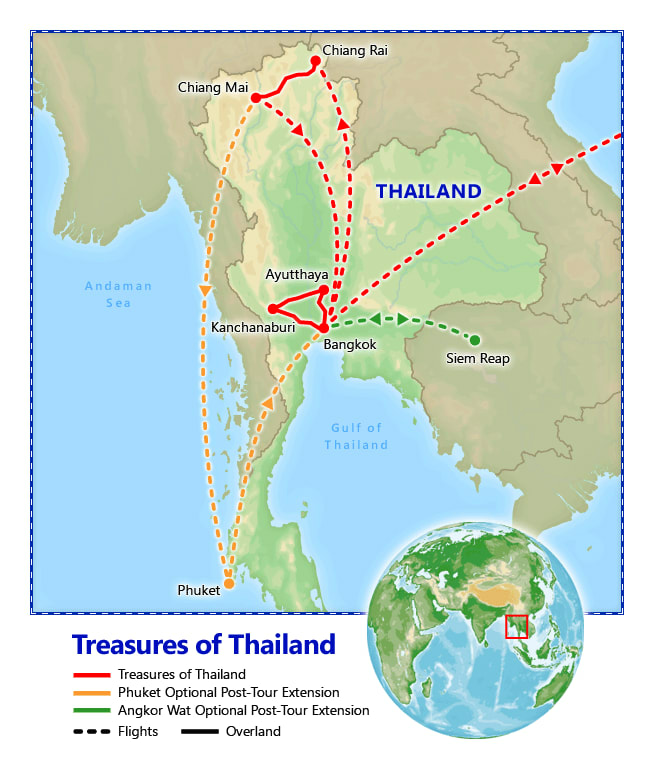 Optional Excursion: Visit to Wat Trimitr & Wat Benchamabophit (purchased locally), $40 pp for 2019; $28 pp for 2020. Enjoy an afternoon tour through the hustle and bustle of Bangkok to visit some of Bangkok’s hidden gems. Visit Wat Trimitr, on the edge of Chinatown, which houses the world’s largest solid 700-year old golden Buddha, and followed by a visit to Wat Benjamabophit, also known as the marble temple featuring a fusion of Thai and European styles. Optional Excursion: Muay Thai Show (purchased locally), $72 pp for 2019; $76 pp for 2020. In the evening, transfer to your Muay Thai live Show. Created by acclaimed director Ekachai Uekrongtham, Muay Thai Live: The Legend Lives is a spectacular stage show about the history of Thai boxing, from its origins to present day. The show is presented in five thrilling chapters – The Tiger King, The Prisoner with Eight Limbs, The Warrior with Broken Swords, The Lethal Art of Muay Thai, and The Modern Action Hero. It also includes Muay Thai Live Boxing: Warrior Rising. A unique program that shows how the ancient and sacred art of Muay Thai has evolved into one of the most spectacular martial arts in the world. Accommodations: 1 night U Inchantree or similar. Included meals: Breakfast & dinner. Full Day Itinerary: Today, enjoy the lively atmosphere all over Chiang Mai, as people gather in the open spaces splashing water on each other in celebration of Songkran, the Thai New Year's festival. This morning, travel to Wat Phra That Doi Suthep, built in 1384 and one of the most revered temples in Thailand. Climb the 309 steps of the Golden Naga staircase to reach its golden pagodas. Inside the cloister of the temple, you will see one of the most sacred stupas. Walk around the compound and admire the many bells and statues of Buddha. Throughout the day, observe Songkran rituals of alms giving, sand castle building, and "Rod Nam Dam Hua," a water pouring ceremony to ask forgiveness and blessings from respected elders. Traditionally, multiple generations of a Thai family will gather for this ceremony. Afterwards, enjoy a delicious bowl of Khao Soy. This famous Northern Thai dish is a combination of coconut cream, crispy noodles and plenty of spice that is sure to delight! Enjoy the rest of your day at leisure or take part in the Songkran celebrations of splashing water around Chiang Mai! Take advantage of your already-included international airfare by joining our extension to Cambodia for a special opportunity to visit Angkor Wat, a massive complex of temples that ranks among the most fascinating religious sites in the world. For JFK passengers, the Angkor Wat Extension must be arranged on a custom basis to be coordinated with China Airlines' JFK schedule; please contact us for details.